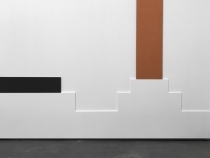 In the last years Elodie Seguin has defined a unique approach to painting exploring the relationship between several painted objects as much as their organization within and their relation in turn to the given exhibition space. Her work summons the viewer’s attention by documenting the temporality of the work – which exists in a state of unending suspension.The works appear to be in the making, in the process of becoming, taking the risk of disappearing. Their often characteristic Not Yet Titled often contains their essence: they become fixed regretfully, preferring to keep in their midst other possible deployments. Here, the exhibition is undertaken as a transposition, a displacement of context in which the presented elements are states of being, perceived differently according to the space in which they are placed. 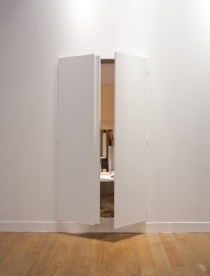 It would be almost possible to define Elodie Seguin’s work by the space surrounding it, as though deducing it. The materials glide in, or brush past, settling there without imposing themselves, so as to be more suggestive. Rigour combined with sensitivity are the great strengths of this French artist. Purely pictorial, though without ever becoming embodied on a framed canvas, her pieces act as multiple media, without ever quite denying their painterly nature. 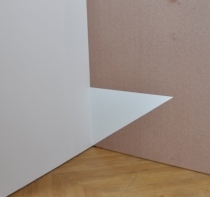 Oftentimes the elements of her works, consisting of materials such as wood, paper, MDF, or cardboard, are not joined together but simply placed on top of or next to each other, leaning on the gallery walls or carefully placed directly on the floor of the exhibition space. Usually we find the single surfaces of these elements painted in somewhat unique monochromatic colors which are not easy to categorize, tending to osscilate between red and orange, yellow and ocker, blue and green, etc., and always calmly balanced against each other. Each presented element is independent yet engages in dialogue not only with other elements that share the same space, but those that preceded in practice. The question of limit is posed; a common border between mediums – and their possibility to extend themselves into one another. A principle of economy, if not restriction, governs these gestures so to make them a responsible transparency. For its reductivist tendencies Seguin’s work reveals an obvious affinity to the minimalist tradition. At the same time her theoretical and phenomenological interest in color as a dimension of perception links her approach to a modern tradition of painting which may have begun with Mondrian and Malevich and found its continuation with artists like Newman, Palermo, McCracken and others.